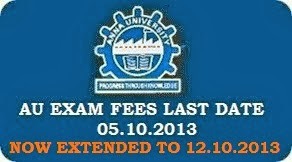 Latest Update 02.10.2013: Most of the colleges fixed Last Date for Exam Fee is 03.10.2013. That is Tomorrow. So, Don't forgot to took money to register for Anna University Examinations. portal. All are requested to print the courses registered and circulate to all the students. After the confirmation from the students, you are requested to complete the registration work and generate the applications for all the students. The registration for the students who have completed the programme also should be carried out in the web portal. 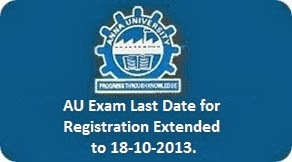 The last date for the registration of courses for the November/December 2013 examinations will be 05-10-2013. All the Principals are requested to complete the work in time and send the applications, abstract of the courses registered by the students and the fees to the office of the Controller of Examinations latest by 08-10-2013. All the students (including those who have completed the coursework and having arrears) are requested to contact the Principal of the College for registration and payment of examination fees."